REPLAY VIDEO: Join NOWCastSA 11:30 a.m. to 1 p.m. on Thursday, Sept. 25 for the the live webcast SA2020's 2014 Progress Report Release. The report will feature an update on the community’s progress towards each of the 60 Measures of Success that make up the SA2020 community vision. A limited number of individual seats and sponsorships are still available, and you can click here for more information. Thanks to the underwriting support of SA2020, anyone can participate via live webcast or come back and replay the video later right here on this page. District 10 Watch Party: 11:30 a.m. - 1 p.m. at Get Up Community Center, 6227 Krempen Ave., hosted by District 10 Councilman Mike Gallagher & The Get Up Community Center. Light lunch provided, please RSVP to cony40@aol.com. 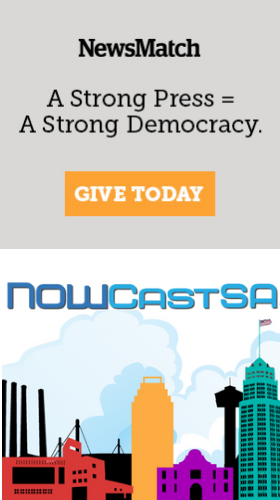 NOWCastSA has partnered with HelpSocial to monitor and measure online civic engagement for this event. We are delighted to be test-driving HelpSocial's new social media monitoring platform, which was originally created by a team at Rackspace Hosting to help Rackers respond to the needs of their Twitter followers (read their story here). Figuring out how to accurately measure online civic engagement in a meaningful way has been an ongoing project for the NOWCastSA team, so we're honored to help the HelpSocial team learn how its social customer service tool can contribute. Plus, we like that we are working behind the scenes to collect and analyze our own social media data while we help SA2020 share its cool new data dashboard with the community.